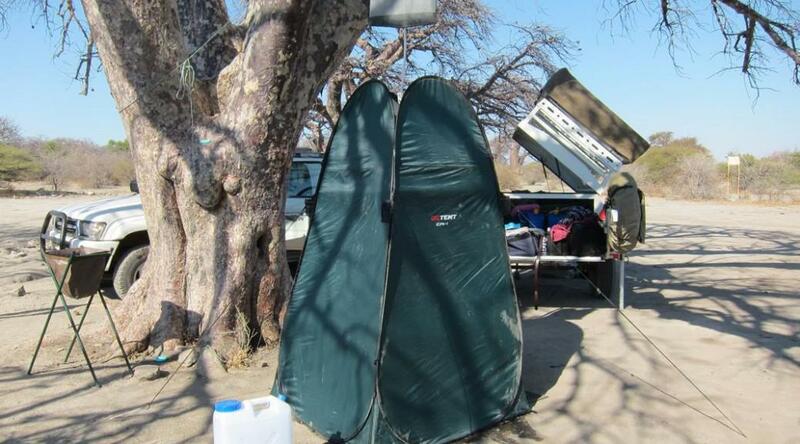 The funny thing about lion is that they don’t seem to realise that your tent is just a few threads thick. As long as your tent is fully zipped up you will be safe because lions see your tent as an impenetrable barrier. 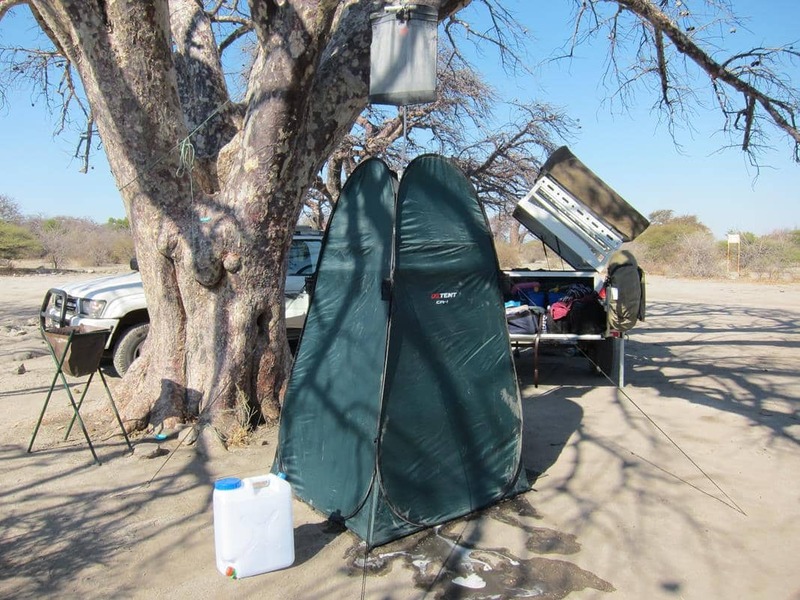 A few years ago a camper in the Matusadona National Park in Zimbabwe left his feet sticking out of his tent because it was unbearably hot. He got drawn out of his tent and was devoured by a lion! Remember to take a suitable container to bed at night if you camp in the wild. A plastic container with a screw top which you empty the next morning works fine. For men a fabric softener or fruit juice bottle is ideal but for obvious reasons women need a plastic container with a bigger opening, like those containing protein drinks. If you are a fastidious girl who doesn’t like to squat over a plastic container there are different options available. In a rooftop tent you can use a female urination device like an Eezi-Wee, GoGirl or Wee-Jon. The first two are made from silicone and shaped to fit the body. They can be attached to a pipe which drains into the ground or into a container. A Wee-Jon is a funnel attached to a bag with powder which turns into a gel when it gets wet. They are available at various outdoor shops. These sound great but the girls that I have spoken to found them quite difficult to use at first because you have to really make an effort to get your aim right. The Wee-Jon is most probably the best of the three but not environmentally friendly. If you sleep in a ground tent, caravan or trailer you can choose to keep it simple by using an old fashioned potty which you clean out in the morning or you can go for a portable chemical toilet. The four major brands on the market are Porta Potti (Thetford is the original brand but there are various similar products on the market today), Bi-Pot, and Passport Potty. They are available from outdoor shops. Some women campers prefer to use these portable toilets for all their needs in the bush but for me a plastic container at night and squatting and using a spade during the day works fine. Quite frankly I much prefer that to filthy public toilets or transporting and cleaning out a portable toilet. 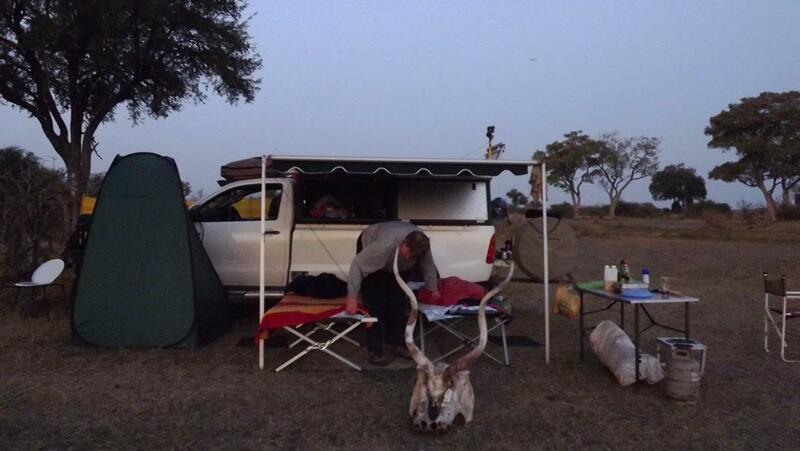 Please tell us if you have an ingenious solution to this problem and also see our post about etiquette for wild camping in Africa. A pair of slipslops should be part of your basic camping list! You will often run into campsites where the showers and baths aren’t immaculate. When in doubt, shower with slipslops to prevent fungal infections or use them to step on when you get out of the bath. (I must confess that my pet spoil is a small towel bath mat that always goes camping with me because I find that the floor is always wet after a shower.) If you like bathing, always clean out the bath with a disinfectant before you use it and make sure you carry a universal size bathplug in your toiletry bag. The other difficulty about camp bathrooms is that you don’t often have a clean surface on which to put your towel, toiletries and clothes. For that reason I have a bathroom carry bag in which I take all my things to the bathroom and it also serves as clean space on which to leave my things, either on the floor or hanging up behind the door. For the utmost in quick-and-clean simplicity you can warm water in a bucket or jerry can over the fire and wash up from a basin. Otherwise drop a small submersible pump connected to a shower head into a jerry can of warmed water for a hand shower. To carry and set up a more substantial camp shower is a luxury and can waste precious drinking water if you’re not careful. Dave Smith’s camp shower at the Mamili National Park. It can be cumbersome to set up a portable shower, especially the more complex ones that provide hot water and a collapsible enclosure. These are less than ideal when you break camp every day. However, camp showers are the easiest way to wash long hair and offer an enjoyable way of cleaning up after a hard day out. Various types and models are available at outdoor shops. The most basic consist of a suspended water container with shower head. Others include a water pump; there are models that also provide warm water and some come with their own collapsible enclosures. Some of the basic suspended showers are made of black plastic so that they can also warm your water when put in the sun. Experienced overlander Dave Smith from Windhoek built his own gas geyser because he found that the solar system which he bought at an outdoor shop didn’t fulfil their needs; it took a long time to heat the water, it was difficult to use and the chances of getting a leak were high because they had to move it constantly to keep it in the sun. They also had to be extremely cautious when stopping under low branches to prevent puncturing the bag. 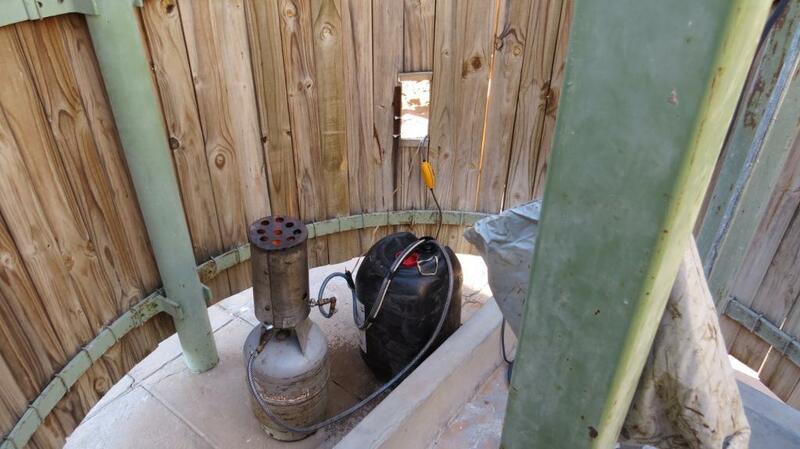 Dave Smith used his home-made geyser at Rooiputs camp in the Kgalagadi Transfrontier Park. He then made himself a geyser from an old gas lamp. It fits on a normal gas bottle and takes about five minutes to heat 25 litres to 40 degrees. When the water is warm they attach a pipe with a shower head to the can and voila, both he and his wife have a beautiful warm shower. The 12V pump circulates the water through the can whilst heating it and then pumps it from the can to the shower head. Let us know what works best for you and tell us if you have perfected a home-made system. The call of nature is normal and of course, you will not be able to avoid that when you are out in the woods, camping. Hence, you must be prepared and even go out of your way to rent a portable toilet for your convenient usage. I’ve got a Go Girl lying in my cupboard, I can’t use that thing – it give me stage fright! I have found the best is to keep a medium sized plastic bucket with a lid in the corner of our tent (usually behind the camping clothes cupboard where I can hide), with a plastic bag and toilet roll – toilet paper goes into the plastic bag – just throw that out in the morning and rinse out your bucket! Good idea to keep the dirty toilet paper separate, Janine. Gordon, I’ll try to twist Dave’s arm. Gordon, Dave was kind enough to share the design of his bush geyser with us. Because it is a homemade geyser and can be dangerous if not used with caution, I’d rather send the design offline to you or anybody else who would like to have it. 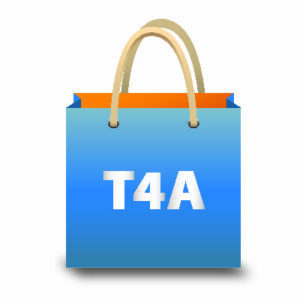 Please send me (karin@tracks4africa.co.za) your email address and note that neither Dave Smith nor T4A can be held responsible for any incidents that may occur from using this geyser. That’s a a great idea! Anybody interested in Dave’s water heater can mail me directly at karin@tracks4africa.co.za and I will send it to you.